HALIFAX -- A massive and powerful storm pummelled Atlantic Canada on Thursday, shutting down everything from schools to bridges as wind, rain and snow thrashed the region. "This is a very large, very intense storm," said Darren Borgel, a meteorologist with Environment Canada. 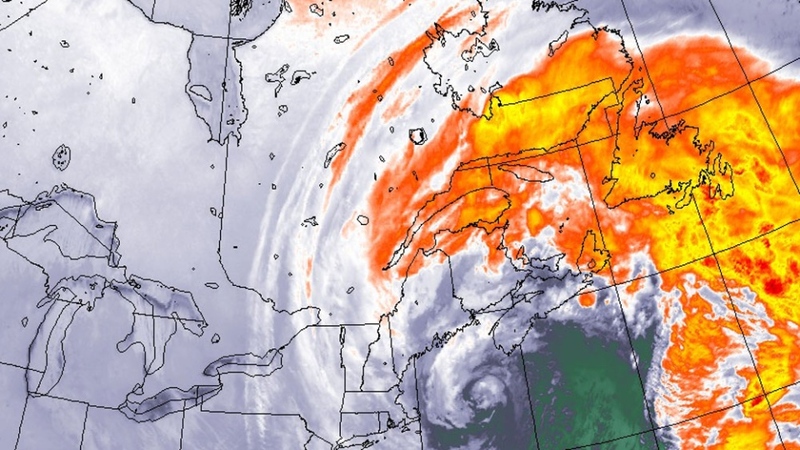 "This one will definitely be memorable for its extreme winds, especially in Nova Scotia." Social media images showed one Halifax house with its roof gone, and another building that had partially collapsed. At high tide the storm surge flooded parts of Halifax's famed waterfront boardwalk, moving a Canada 150 sign and lapping at an ice cream outlet. Water also poured into an excavation site of a massive hotel/office complex. And 20 minutes before high tide, the surging ocean had swallowed a dock at Halifax's Dingle Park and flooded the short causeway connecting the nearby Armdale Yacht Club to the mainland. While parts of Nova Scotia were whipped by wind and rain amid temperatures well above freezing, New Brunswickers faced heavy snow that made it impossible to see across the street. 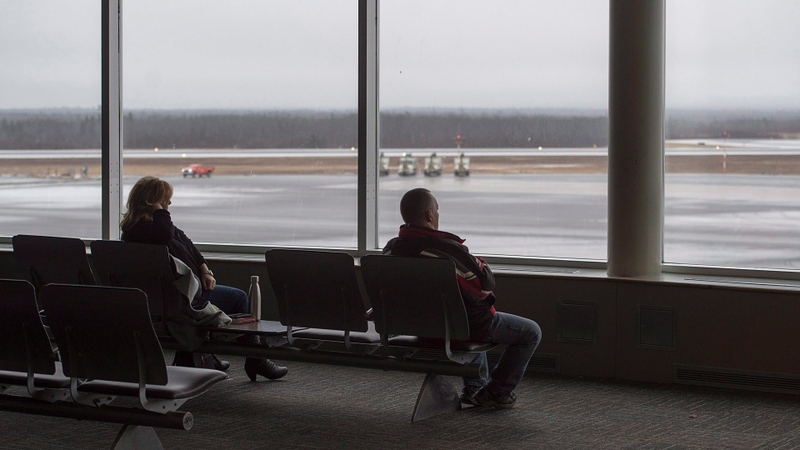 "If you are in your home and don't need to travel, don't travel," said Greg MacCallum, director of New Brunswick's Emergency Measures Organization, who called it a "serious storm." 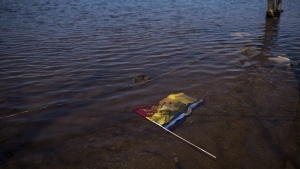 Environment Canada said high waves combined with storm surges could cause damage along the Atlantic coast of Nova Scotia and in Prince Edward Island later in the evening, and that flooding was also likely in those areas. The weather agency said high waves would persist overnight and may cause further flooding and pounding surf near high tide on Friday morning for southwest facing coastlines. Borgel noted high tide was expected to coincide with the greatest surge in the evening along the Atlantic coast of Nova Scotia, just as winds were forecast to pick up again. "I expect there's going to be some serious damage when things come to light on Friday morning," he said. The agency warned that people should not attempt to travel across flooded roads because even shallow, fast-moving water can sweep a vehicle away. Environment Canada had issued warnings for everything from wind and rain to blizzards and storm surges along much of the Atlantic coast. "There's a varied mix of weather conditions depending on where you are in the Maritimes -- the whole spectrum of weather," said Borgel. The federal agency had issued a range of winter storm warnings and watches for Nova Scotia, New Brunswick, P.E.I. and parts of Newfoundland and Labrador, saying the low-pressure system would bring fierce winds that could gust up to about 140 kilometres an hour in parts of Nova Scotia and snowfall amounts of up to 40 centimetres in New Brunswick. Nova Scotia was expected to see up to 50 millimetres of rain, possibly causing localized flooding. By Thursday evening, many lights were out across Nova Scotia. About 94,000 utility customers were without power as of about 1:30 a.m., Friday, many along the Atlantic coast. In downtown Halifax, the wind started to howl early in the afternoon, sending sheets of rain sideways, stinging pedestrians as they headed home early from work. Sandra Simons, who lives across the harbour in Dartmouth, was running to catch the last ferry of the day. The service was cancelled early at 2:30 p.m. as the harbour was churned into a roiling mass of whitecaps and heavy swell. "It's lovely," said Simons. "I like the wind, I like the waves, but it's hard walking. Still, the wind is really bad here. The ferry behind us is the last one going across, so I'm just running for that." Breanne Barry was also on her way home to Dartmouth, but she missed the last ferry. "It's crazy -- the wind is getting really bad," said Barry, as she grabbed the fur-lined collar of her parka as it was whipped by the wind. "I'm just happy that we haven't got any snow. I just want everyone to stay safe and stay off the road." 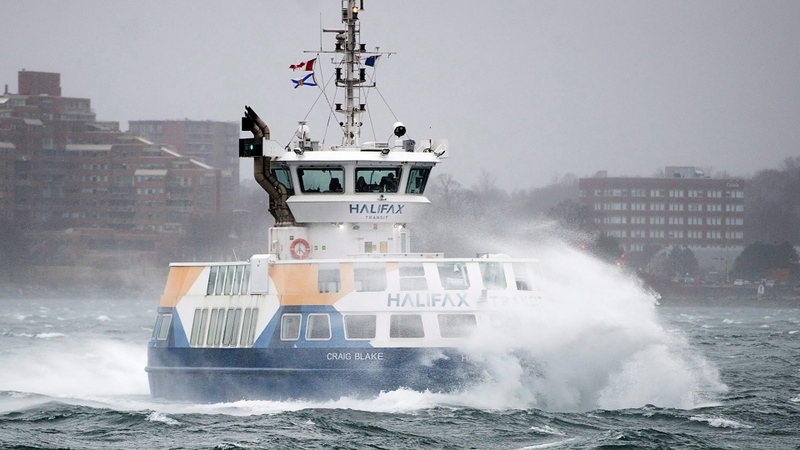 Halifax also pulled its buses off the road at 4 p.m., closed the city's Public Gardens and shut one of two harbour bridges because of the wind. Later in the evening at the Herring Cove lookoff near the mouth of the Halifax harbour, a row of spectators gathered in the dark, the headlights of their cars illuminating massive waves breaking against the rocks. The severe weather prompted Prime Minister Justin Trudeau to urge Atlantic Canadians to be vigilant. "To everyone in Atlantic Canada -- stay safe, stay indoors, and stay updated on the latest," he said on Twitter, linking to the Environment Canada website. Virtually all of New Brunswick was under either winter storm, rainfall or wind warnings and the central and northern parts of the province were expected to see roughly 40 centimetres of snow, along with wind gusts of up to 90 km/h in some areas. Environment Canada said early Friday that while heavy snow and blowing snow was expected to continues for the northern half of New Brunswick, the snow has changed to a mix of freezing rain and ice pellets for central areas overnight. Snow was expected to end by late morning over southern New Brunswick but persist into the afternoon for northern areas. MacCallum said NB Power added extra crews and pre-positioned them in areas of the province where outages were likely to occur. The utility was reporting about 10,400 outages as of about 1:30 a.m. Friday. MacCallum also warned about the dangers of carbon monoxide, and said people should have carbon monoxide detectors in their homes. "If not, be aware of the threat and avoid doing things like cooking over open flames, using generators near the house or in a garage. These things produce carbon monoxide gas and it will kill people," he said. Two people died and others were hospitalized during an ice storm that hit the province in January of last year. MacCallum said EMO is working with the Red Cross to identify warming centres and shelters in the event people are left without power for an extended time. P.E.I. was expected to be hit by fierce winds and up to 25 centimetres of snow before it changes to rain and ice pellets in the evening. Maritime Electric said early Friday that power was out in about 20 communities. The Confederation Bridge linking New Brunswick and P.E.I. was closed to all traffic "for user safety" Thursday night "until the current weather situation changes," but later reopened to cars. Nova Scotia Power said it had more than 1,000 people at the ready in what is its biggest-ever pre-storm mobilization of personnel and resources. 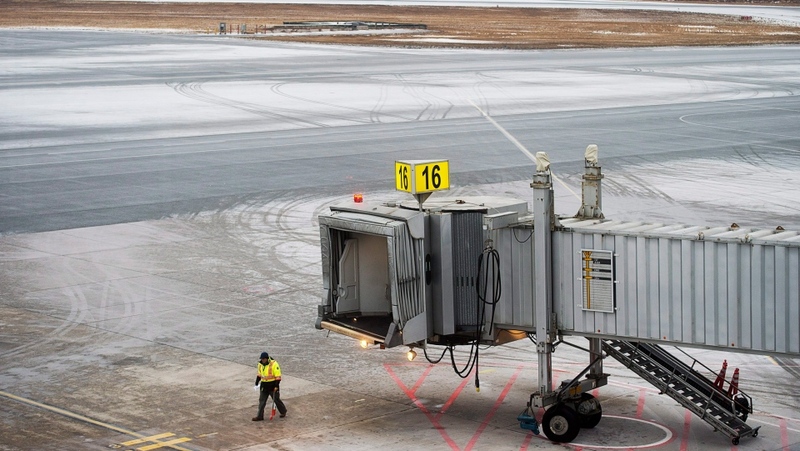 More than 50 departures and arrivals were cancelled at Halifax Stanfield International Airport early Thursday. Marine Atlantic also cancelled sailings between Nova Scotia and Newfoundland, while Bay Ferries shelved its crossings between Nova Scotia and New Brunswick. School boards in Nova Scotia and P.E.I. didn't wait for the storm to arrive, with most schools and some universities closing well before the weather set in. Many government offices, schools and businesses also shut down for the day. The Halifax Regional School Board warned Thursday evening that almost half of its 134 schools were without power, and further cancellations were possible on Friday. Environment Canada said the storm -- which was being dubbed a "bomb cyclone" -- was expected to continue its northerly trek, with snow and strong winds in expected parts of Newfoundland and Labrador Thursday evening and into Friday. In the U.S., the storm dumped as much as 45 centimetres of snow from the Carolinas to Maine and unleashing hurricane-force winds. Forecasters expected the system to be followed immediately by a blast of face-stringing cold air that could break records in more than two dozen cities, with wind chills falling to -40 in some places this weekend. Three people were killed in North Carolina after their vehicles ran off snow-covered roads, authorities said. -- With files from Kevin Bissett in Fredericton, Michael MacDonald in Halifax, and The Associated Press.